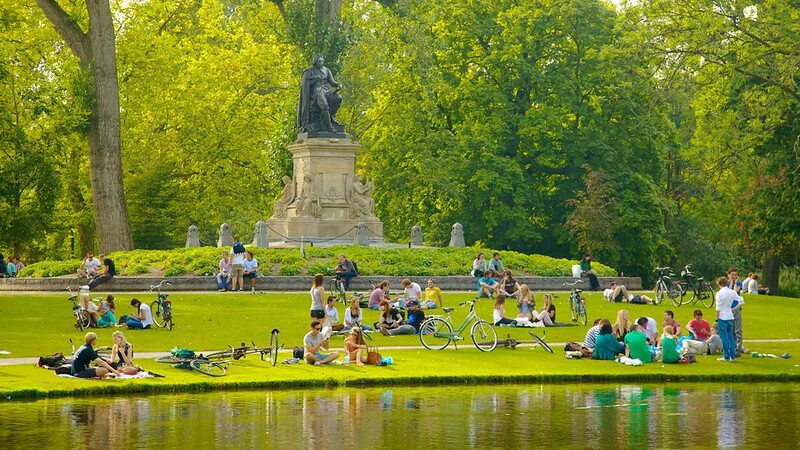 One of the most beautiful parks in Amsterdam is Vondelpark, also known as ‘the Central Park of Amsterdam’. The variety of trees, ponds and birds is incredible. We have our own lovebird; a ring-necked parakeet that, according to some stories, escaped from a cage and somehow survived the winter. Explore the park and try to spot the Dutch lovebird! Go for a stroll with your loved one by the canals. 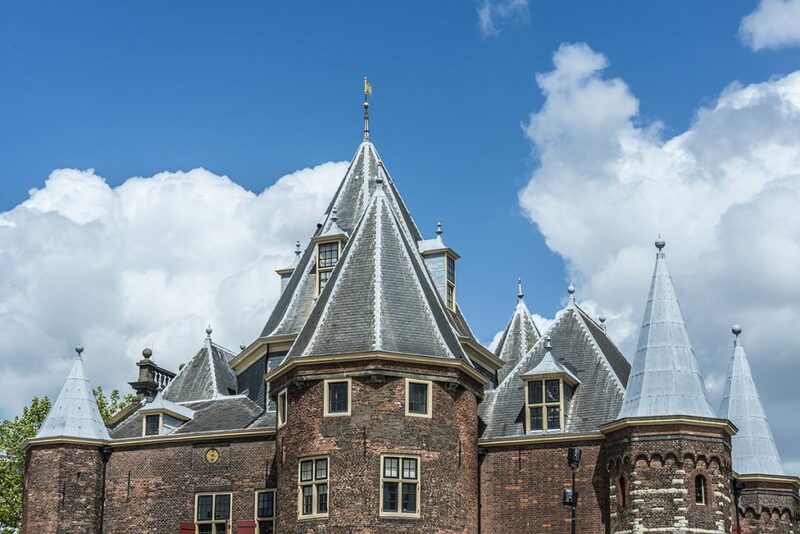 The city centre and the canal belt were built in the 16th and 17th century; the houses are wonderful, and the setting is so scenic that you feel like you are walking in an open-air museum. 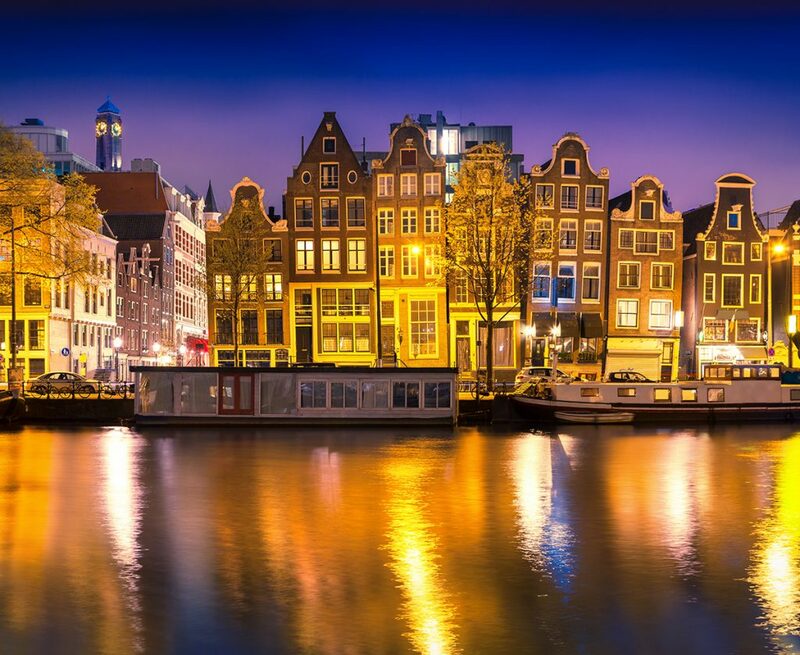 If you go out for a walk at night, be sure to pay attention to the romantic street lights that keep the city illuminated, they emphasize Amsterdam’s unique atmosphere. Originally built in 1488, this characteristic building in Nieuwmarkt used to be a city gate but now houses a restaurant-café; In de Waag. With a beautiful interior design, and a great atmosphere, the restaurant is lit entirely by candlelight. 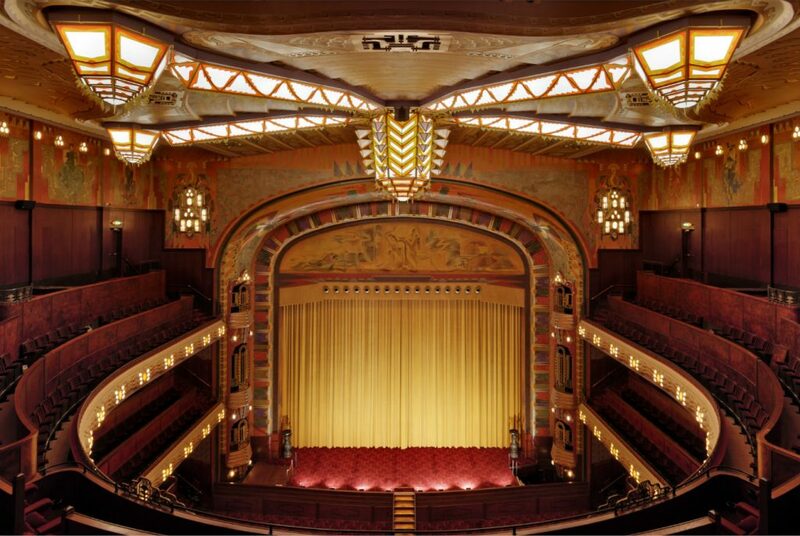 Cinema Pathé Tuschinski was built in 1921, and its exterior and interior are a spectacular mix of styles; Amsterdam School, Art Nouveau and Art Deco. It is one of the most beautiful cinemas in the world. Here you can treat yourself to a double “love seat” on the balcony or a “private box”, where you can even order champagne! Visit their website for more information. 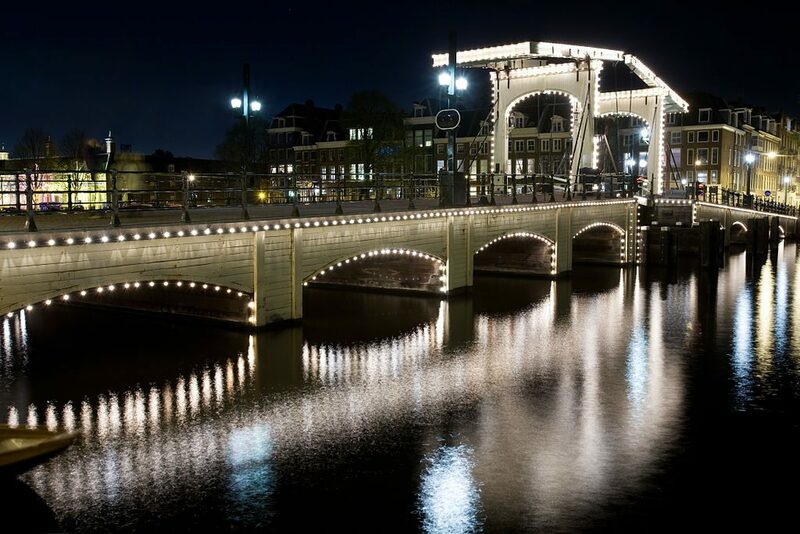 The most famous bridge in Amsterdam, between Carré Theater and Kerkstraat. It is said that those who kiss on the bridge will remain together forever. I cannot guarantee that of course, but I do guarantee that the bridge is breathtakingly romantic at night! 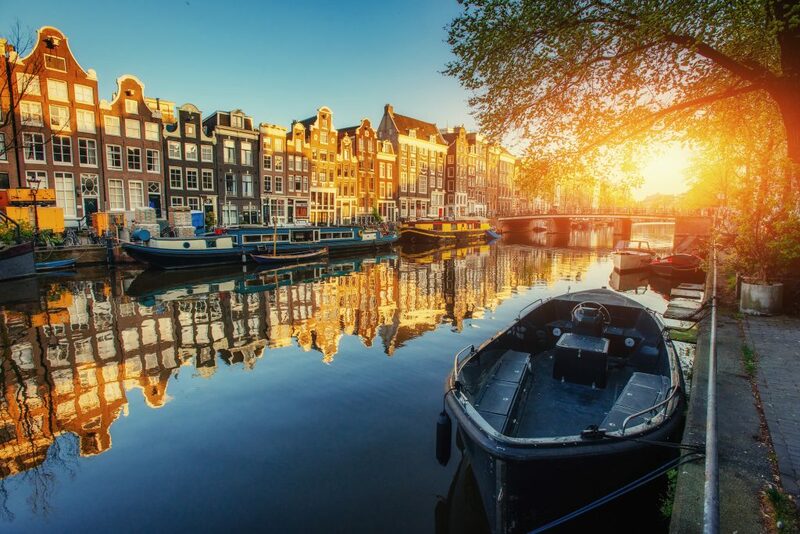 With its 165 canals, Amsterdam is often referred to as “the Venice of the North”, so it’s imperative to take a canal cruise during your stay in the city! My favourite, and the most romantic time of the day to go on a cruise is at sunset, when you get a low, warm sunlight shining on the 17th century houses. A truly magical moment to share with your loved one. 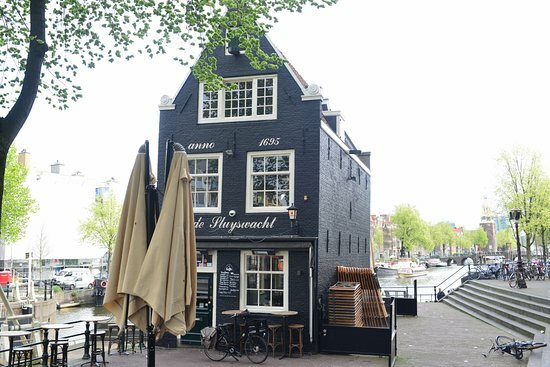 Amsterdam has many leaning houses, but one of these stands out from the others, and that is the historical Sluyswachterhuisje (lockhouse). Just a few weeks ago, I was enjoying a drink here with some travellers, and indulging in this café’s unique atmosphere – which is especially palpable on the first floor! It is a warm and distinctive place with stunning views over the canals. 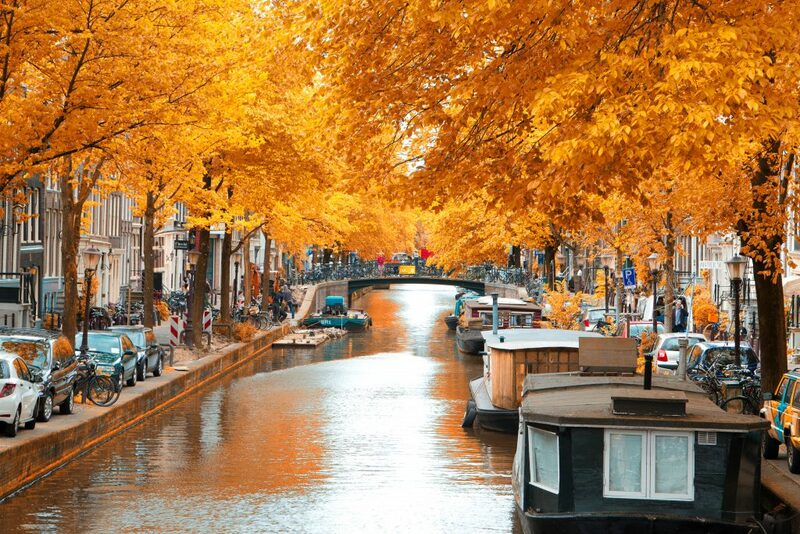 This is, in my opinion, the most beautiful canal of all – one of those places that’s not to be missed! The best pictures of Amsterdam are taken here, from the middle of the bridge. It’s in the picturesque and charming Jordaan district and, if you have the chance, I’d recommend you rent a small boat and visit the area. Just to give you an extra one! “The Fault in Our Stars” is a touching love story between two teenagers battling cancer. 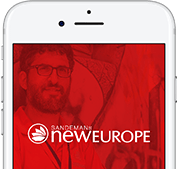 The couple shared a very special moment on a bench located near the intersection of two beautiful Amsterdam canals, the Herengracht and Leidsegrach. If you’re a fan of the film, sitting on this bench is sure to give you goose bumps! 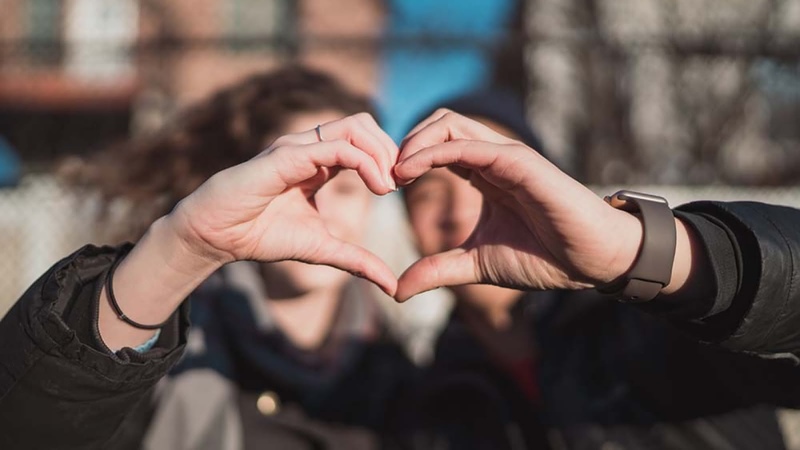 If you’d like to find more romance in Amsterdam and make your Valentine’s Day magical, join Rocco on the Romantic Waters Boat Tour. An intimate journey of discovery along the canals, when the city winds down and reveals itself at its most alluring. For more information and reserve your spot, please send an email to info@romantictoursamsterdam.com.